LUCE, Robert, a Representative from Massachusetts; born in Auburn, Androscoggin County, Maine, December 2, 1862; attended the public schools of Auburn and Lewiston, Maine, and Somerville, Mass., and was graduated from Harvard University in 1882; taught in the Waltham (Mass.) High School for a year; engaged in journalism, founding and serving as president of the Luce's Press Clipping Bureau in Boston and New York in 1888; Republican member of the State house of representatives in 1899 and 1901-1908; studied law and was admitted to the bar in Boston in 1908, but did not engage in extensive practice; president of the Republican State convention in 1910; Lieutenant Governor of Massachusetts in 1912; member of the Massachusetts Teachers Retirement Board 1914-1919; delegate to the State constitutional convention 1917-1919; president of the Republican Club of Massachusetts in 1918; Regent of the Smithsonian Institution 1929-1931; author, notably on the subject of political science; elected as a Republican to the Sixty-sixth and the seven succeeding Congresses (March 4, 1919-January 3, 1935); chairman, Committee on Elections No. 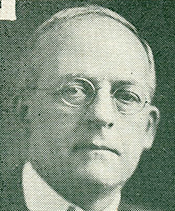 2 (Sixty-seventh Congress), Committee on World War Veterans' Legislation (Sixty-eighth Congress); unsuccessful candidate for reelection in 1934 to the Seventy-fourth Congress; elected to the Seventy-fifth and Seventy-sixth Congresses (January 3, 1937-January 3, 1941); unsuccessful candidate for reelection in 1940 to the Seventy-seventh Congress; resumed his former business pursuits; died in Waltham, Mass., April 7, 1946; the remains were cremated and the ashes interred in Mount Auburn Cemetery, Cambridge, Mass. Papers: Correspondence with Waldo S. Kendall of Minot, Kendall & Co., inc., Boston, 1928-1941. 666 items. Letters relating to Luce's investments and to political matters affecting the investment business. Indexed in library's catalog. Luce, Robert. The benefits of commissions; The flexible tariff: Speeches of Hon. Robert Luce of Massachusetts in the House of Representatives, January 23 and February 4, 1930. Washington: Government Printing Office, 1930. ------. Congress, an explanation. Cambridge: Harvard University Press, 1926. ------. Electric railways and the electric transmission of power described in plain terms. Boston: W. I. Harris & Co., 1886. ------. Going abroad? Some advice. Boston: R. & L. Luce, 1897. Reprint, Boston: Clipping Bureau Press, . ------. Legislative assemblies; their framework, make-up, character, characteristics, habits, and manners. Boston and New York: Houghton Mifflin Company, 1924. Reprint, New York: Da Capo Press, 1974. ------. Legislative principles; the history and theory of lawmaking by representative government. 1930. Reprint, New York: Da Capo Press, 1971. ------. Legislative problems; development, status, and trend of the treatment and exercise of lawmaking powers. Boston and New York: Houghton Mifflin Company, 1935. Reprint, New York: Da Capo Press, 1971. ------. Legislative procedure; parliamentary practices and the course of business in the framing of statutes. Boston: Houghton Mifflin, 1922. Reprint, New York: Da Capo Press, 1972. ------. The merger bill: Speech of Robert Luce in the Massachusetts House of Representatives, June 9, 1908. Boston: N.p., 1908. ------. The problems of the time; speech of Robert Luce, chairman of the Republican State Convention held in Tremont Temple. Boston: Republican Club of Massachusetts, . ------. The Public Opinion Bill; speech of Robert Luce before the Central Labor Union of Boston, October 20, 1907. Boston: N.p., . ------. Writing for the press; a manual. Boston: The Writer Publishing Company, 1888. Reprint, Boston: Clipping Bureau Press, 1907. ------. Writing for the press: A manual for editors, reporters, correspondents, and printers. [Boston]: R. Luce, 1886.